…and spend the day with us! Arrange a really different and inspirational experience for your corporate team-building, customer reward or simply a unique group social event. Our packages can be tailored to suit your individual bespoke requirements, thus reflecting the true purpose of your event. With our fleet of four dual seat gliders, we can easily accommodate groups of up to 25 people per day. The day will begin with a refreshment reception followed by formal presentation for all participants including a safety briefing, outline of the day and explanation of how a glider launches and flies. 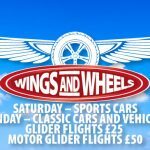 Our experienced instructors will then carry out the actual gliding lessons, with the number and nature of the individual flights being determined by you, the organiser. After you are completely satisfied that your entire group has fully experienced the thrill of gliding, we can arrange a selection of food and drinks to suit your needs in our clubhouse, or if you prefer, we can organise either a BBQ or trip to our local Pub providing a wide selection of cooked meals.